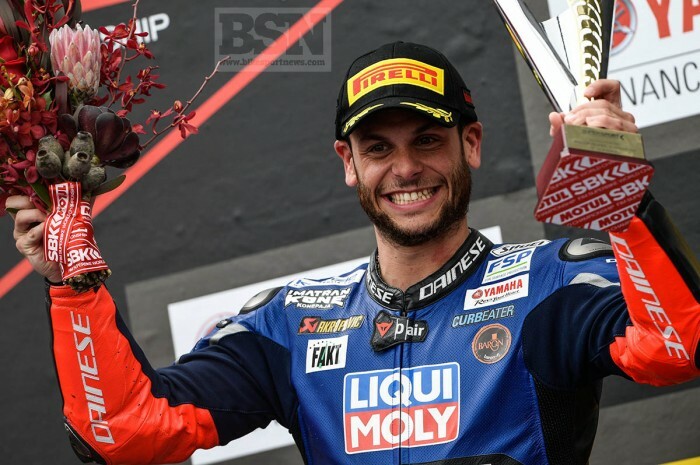 German star Sandro Cortese (Kallio Racing Yamaha) took his first ever WorldSSP race win after a multi-rider fight was wrapped up by his unbeatable pace on the final three laps, and he won by a margin of 1.426 seconds. It was the third straight 2018 victory for Yamaha, but with three different riders. It was also the third all-Yamaha podium. Federico Caricasulo (GRT Yamaha Official WorldSSP Team) was fast and determined but not in possession of enough pure pace in the final laps to compete against Cortese. He did hold off the consistent challenge of Jules Cluzel (NRT Yamaha). Third place was Cluzel’s first podium finish of 2018. With four laps to go Caricasulo passed Cortese into turn two and tried to make a break, but Cortese decided to shed himself of the distraction and eased out a lead with three laps to go. This was only his third race in WorldSSP. Lucas Mahias (GRT Yamaha Official WorldSSP Team) was fourth, on his own, but 5.533 seconds down on a win. A potential podium for Raffaele De Rosa (MV Agusta Reparto Corse by Vamag) ended at the halfway point as he bike gave out and he was forced to stop. In fifth place, Kyle Smith (GEMAR Team Lorini Honda) held off fellow Briton Luke Stapleford (Profile Racing Triumph), as they both passed long time fifth place rider Sheridan Morais (Kawasaki Puccetti Racing). Niki Tuuli (CIA Landlord Insurance Honda) was eighth, with Anthony West (EAB antwest Racing Kawasaki) the top privateer Kawasaki runner in ninth. Rob Hartog (Team Hartog Against Cancer Kawasaki) was the tenth rider home, and the first part-time ESS rider as well. Lachlan Epis finished 24th on his GoEleven Kawasaki. In the championship fight, Mahias leads with 58 points, Cortese is second on 54, Aragon faller and re-starter Randy Krummenacher (BARDAHL Evan Bros. WorldSSP Yamaha) is third with 50 and Caricasulo 49, is in fourth place.